Highly stable and extremely bright reactive fluorescent dye for labeling amino-allyl nucleic acids, native and recombinant proteins, antibodies, and other amine-containing molecules. 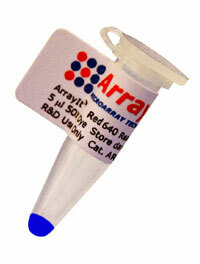 ArrayIt® Green540 absorbs and emits at wavelengths comparable to Cy3™. Product must ship priority overnight.Product ships on dry ice. The package contains 15 ul of 50X dye, shipped in three tubes of 5 ul each on dry ice. Overnight shipping only.